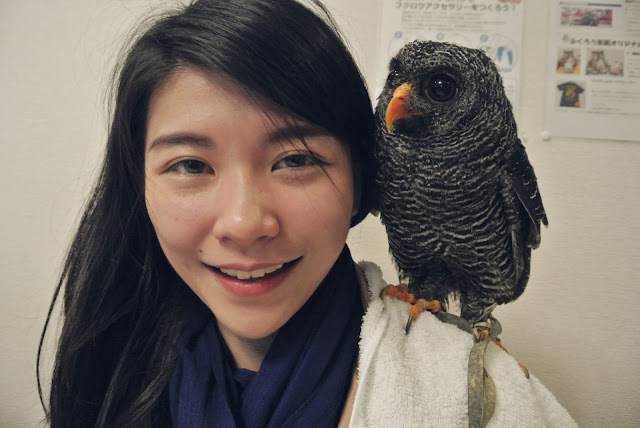 I didn't plan on visiting an owl cafe during my visit to Japan. It was a very last minute thing, decided only when Leon told me that he was heading off to one. We have just finished visiting Ghibli Museum in Mitaka then, so I thought, why not? 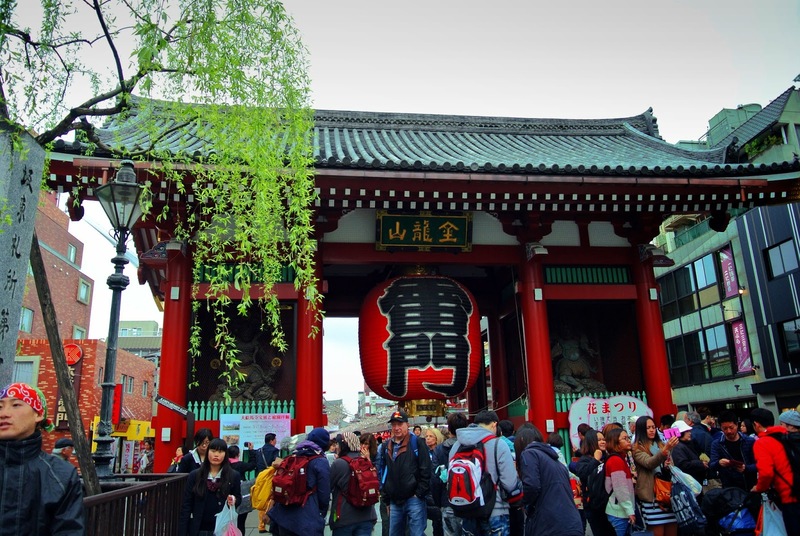 From Mitaka, we took the train to Kokubunji (国分寺), which was 4 stations away. 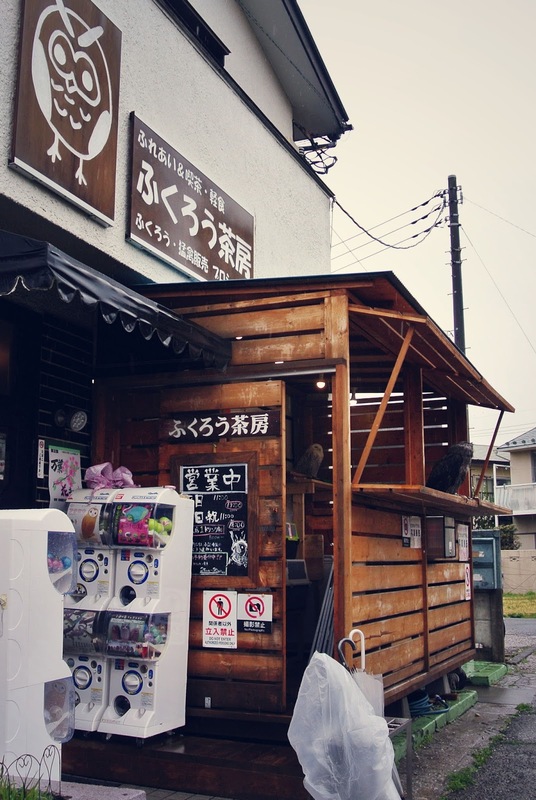 From Kokubunji station, we walked around looking for the owl cafe. I don't remember much about the neighborhood besides it being very cold - freezing morning, remember? Oh and also that it had several shops with dodgy looking signage made up of images of couch, girls and phone/TV screen. Not sure what to make of that besides "Pay to have a video call with girls."? 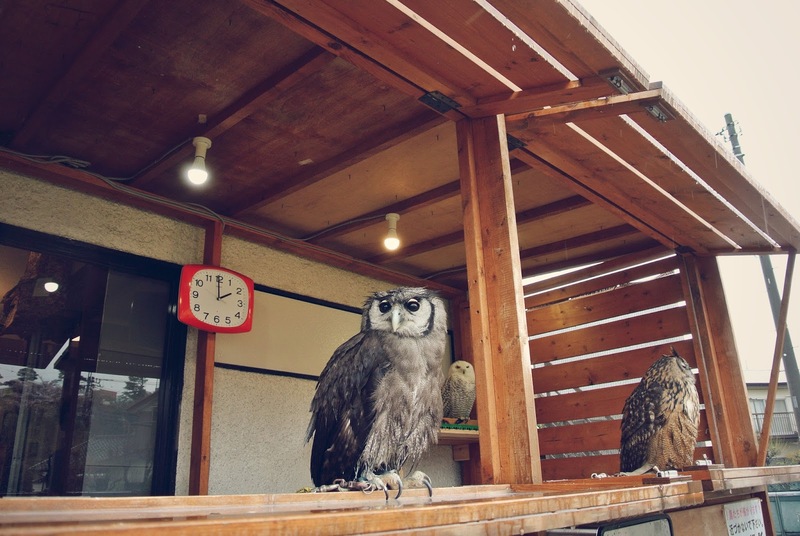 Finally found the owl cafe after a 15-minute walk. This is Hukurou Sabou (ふくろう茶房), Kokubunji's owl cafe. Can you spot some owls already? There were several huge ones chilling at the wooden shed outside. 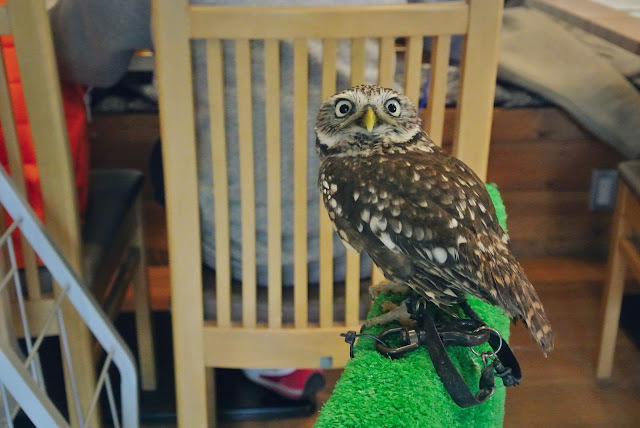 And then there was this surprised baby owl perching on a training board near the cafe entrance. 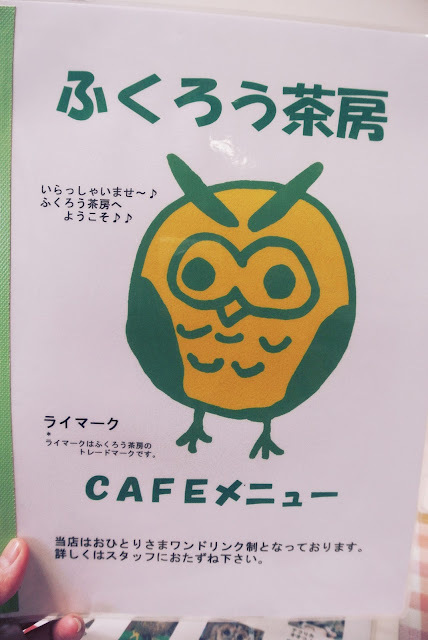 Owl cafes don't usually serve that much of a variety when it comes to food, and the food isn't much to shout about also. Ordered myself a hearty Japanese Katsu Curry Rice. What a wonderful thing to have in chilly weather. I think I ordered hot chocolate but who cares because this cup is the cutest! As we ate, we watched the various owls in glass enclosures next to our table, and chatted about them with the owner. 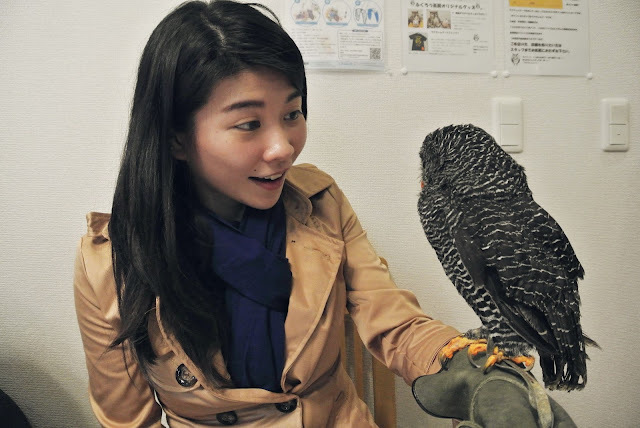 The owner, a friendly lady who speaks basic English, told us about the different owl species and their country of origin (Russia, Australia etc.). There were also some photo albums on the table that we could view. 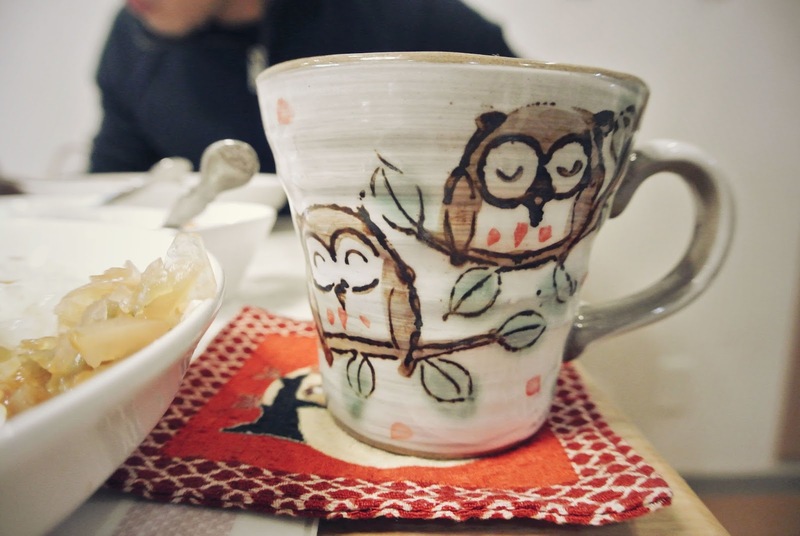 Naturally, they all contained photos of the owls from the cafe. The skinship session that everyone looks forward to! They made us go through this list of instructions before allowing us to select an owl for skinship. 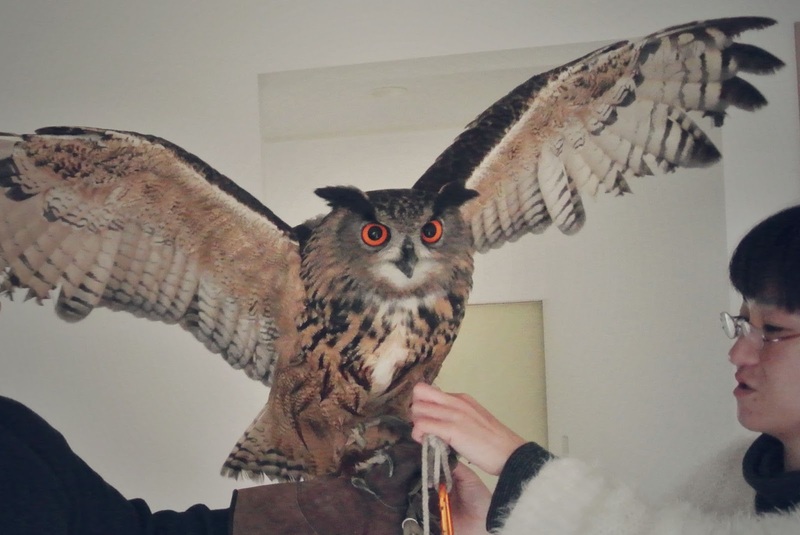 The owls are rotated frequently so they don't get stressed out or tired from all the sessions with over-eager visitors. I really like how they're so caring with the owls. AND THEN, IT WAS TIME TO CHOOSE AN OWL! 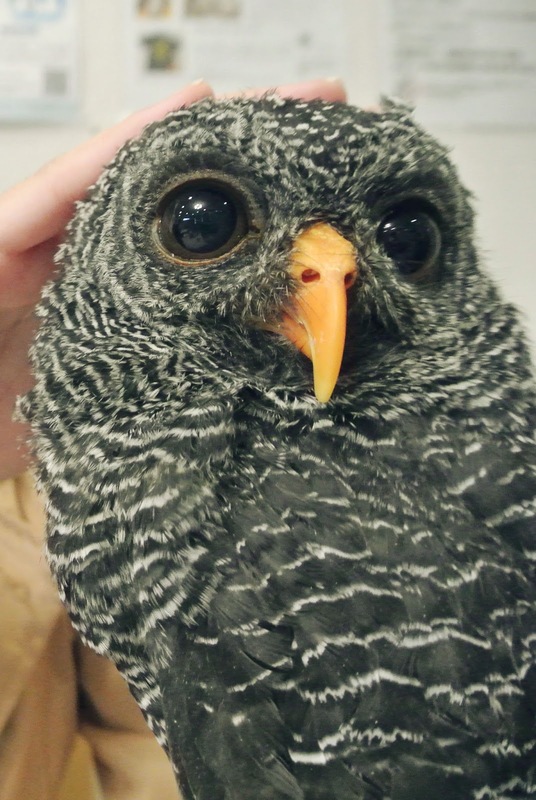 Leon went first and he selected this gorgeous eyeliner-wearing owl. I chose someone smaller and less intimidating. 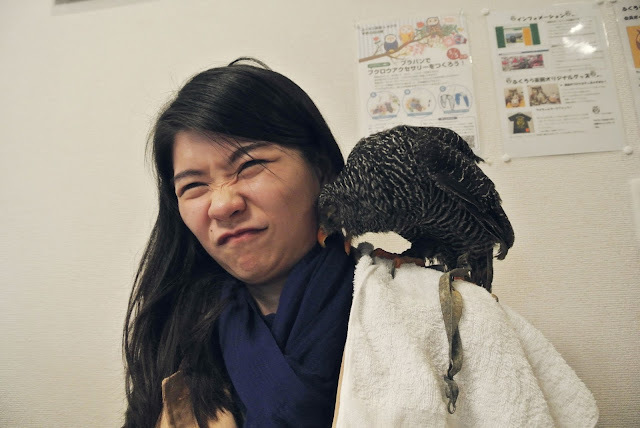 I thought the smaller the bird, the less trouble I'd get; but this little birdie kept trying to grab my scarf when she was on my shoulder. Good session nonetheless. No bird or human was hurt in the process. Later, we requested to see the largest owl in the cafe and were told that the skinship would have to take place somewhere else. The cafe dining area was simply too small to cater for large birds, one flap and things will get knocked over. So we followed a lady to this somewhere else, which happened to be an empty room just upstairs. 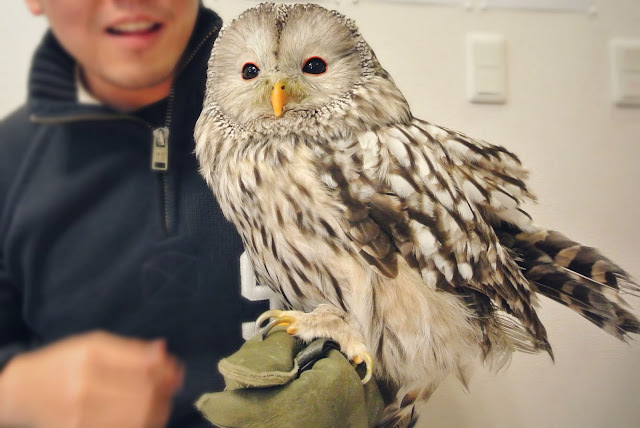 She brought in Rei, the largest owl in the cafe. Rei weighed 8kg if I remember correctly. This is Rei the magnificent. Her one feather alone is already bigger than a pair of glasses. 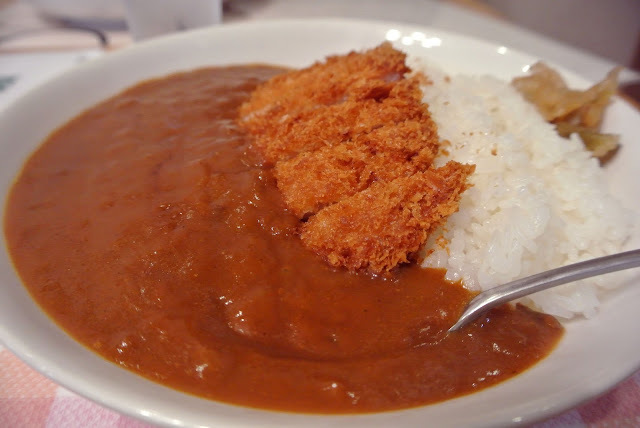 Like many other Japanese shops, the owners and employees here are extremely courteous and helpful. The size of this cafe especially makes it feel homely and personal, as if you're visiting your friend (who has way too many owls at home). This place must have some incredible hygiene standards because it didn't smell one bit during my visit, despite it being a house of birds. The owls too were very well maintained and so clean I could almost lick them. Food and drinks (drinks are mandatory as "cover charge") aside, a skinship session costs ¥300 to ¥1,000 per owl. Price differs according to the size and rarity of owl selected. Interesting hor, it's almost like a TFC for owls.